“Why can’t you just tell me who her teacher is? !” Casey sits down on the couch, sweat beading on her brow as her daughter, Janie, repeatedly rewinds and watches the same clip of a cartoon on the iPad. Casey has been calling the school since June, when Janie’s teacher, Mrs. Naughton, retired after 25 years in the same special education classroom. She was so good with Janie, understanding her personality and her likes and dislikes from day one. The school has been saying that they were working on finding a great replacement, but it is now mid-August and Casey hasn’t heard a thing. Last year Janie loved going to school and loved Mrs. Naughton, but that wasn’t always the case. The transition into Mrs. Naughton’s class was difficult and Janie took a while to warm up, despite Mrs. Naughton’s keen understanding of her needs. Janie’s transition into Mrs. Naughton’s class consisted of crying on the bus ride, pulling out her own hair and refusing to eat breakfast or lunch on most school days. She also refrained from using the bathroom for the entire school day, resulting in accidents on the bus and a urinary tract infection. Mrs. Naughton suggested preparing Casey for the upcoming school year by having her meet the team and talking with her about her new classroom and teacher as much as possible over the summer. Casey is worried that without the proper time to prepare, the transition will go much as it did last time. Back to school is an exciting time, but is also a potentially difficult time of the year for many children with autism and their parents. The new school year might mean a new classroom, new teachers, new staff and new expectations. Change is a difficult thing for many individuals with autism. Adequate preparation for the school year is important, but parents are not always given information early, and changes may occur at what feels like the last possible minute. Schools may be coping with changes as well, and well-meaning administrators just may not have the information parents need. This can add to stress for both parents and children and lead to feelings of frustration at the looming start date in September. One possible way to minimize this stress is to re-acquaint yourself with your child’s Individual Education Plan (IEP) team and provide them with an avenue to get to know your child better. This article will provide a brief synopsis of the roles that different IEP team members may have in your child’s educational plan. We will also talk about suggestions for creating an “all about me” one-page document that details your child’s strengths and challenges, to better prepare staff members to support your child. Special education teacher: Your child’s special educator is the primary case manager for your child. This person will be in charge of delivering specially-designed instruction in the qualifying areas and coordinating with all team members around accommodations and modifications. He/she will also be the one to organize your annual IEP meetings. General education teacher: Your child will likely be assigned a general education teacher based on his/her grade. Depending on your child’s placement, this person will either be heavily or minimally involved in his/her educational plan. This person is in charge of a classroom of students and, as indicated on your child’s IEP, may be responsible for making sure that he/she has access to the general education curriculum. Educational assistants, paraprofessionals/paraeducators, instructional assistants, and classroom aides: These individuals can have many names and usually wear many hats. Often times, these educators are the ones who are implementing the plan that the special education teacher has designed for your child. They spend a great deal of time working with your child to implement the strategies to help him/her learn. Speech language pathologist (SLP): SLPs are responsible for your child’s language and communication goals, if this is an area in which your child qualifies for services. 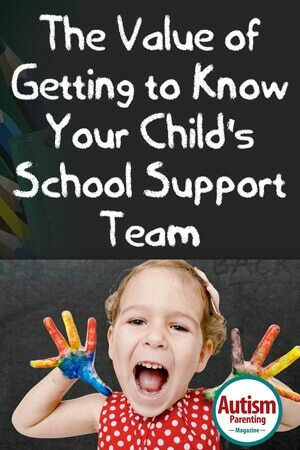 He/she may see your child in the classroom or may pull your child out for direct therapy services. Occupational therapist (OT): OTs are involved in working with your child on tasks related to academic work and/or play and leisure skills. OTs may work on small motor muscles, such as writing or grasping. They may also support a child’s ability to sit appropriately in class with the use of adaptive equipment. Some OTs in schools may also support your child’s sensory needs. Your child’s specific OT services should be clearly outlined on his/her IEP. Physical therapist (PT): PTs work with children in schools to ensure that they can appropriately access the school environment. This may involve support for walking, range of movement or the use of other motor equipment to access school environments. School psychologist: A school psychologist may be involved in assessments or support your child’s needs related to his or her diagnosis. School psychologists can also serve as support staff for teachers and may provide behavioral consultation, if appropriate. Some psychologists work one-on-one or in small groups to support social skills and emotional development. Administrator/principal: Depending on the school district or system, you may be more familiar with your school principal or a district level administrator/coordinator. This person serves as the “administrator” for IEP meetings and is often the one that has the ability to make decisions for the school district during meetings. If you are new to the school system, try talking to other parents to figure out who will be more likely to serve on your child’s IEP team. Specialists (music, art, PE): These individuals teach special classes related to their area of expertise and training such as music, art or PE. Their interactions with your child may be more limited since these classes do not occur every day. …Casey spent the better part of an afternoon working on her plan. She used the school website to create a list of the educators involved in Janie’s care last school year and would likely be on her team again this year. She then created a one page “All about Me” document with a cute picture of Janie that described some of the most important things that someone working with her should know. She sent this in an email to each team member, including Janie’s principal, whom she had met several times in IEP meetings and at school events. She also sent the “All about Me” to the office staff, so that they would have some information about her adorable daughter and perhaps help to get in touch with her as soon as information was available about Janie’s new teacher. In her email, she stated the importance of preparation for Janie when it comes to returning to school for the next school year and asked if there were times when staff might be available for Janie to stop by and say hello during their first prep week back. After doing this, Casey felt empowered and more prepared for the school year. She knew taking the time to reach out could create an opportunity for Janie to meet her new teacher, and regardless, she decided she would visit the school grounds with Janie to help her with the transition. Casey also felt relieved to know that Janie’s team might understand her a bit better now that they had information about what works and doesn’t work for her. Although the transition back to school can be a scary and intimidating time for parents of a child with autism, there are things that can be done to alleviate stress around preparation. Understanding your child’s school team, setting up a meeting, visiting the school, and conveying information about your child in a way that is quick and easy to understand may increase the chance for smooth transition and reduce feelings of anxiety about the coming school year. Annette Estes, PhD, is the director of the University of Washington Autism Center. The UW Autism Center is committed to clinical services, research, and training to improve the lives of individuals with autism spectrum disorders and their families across the lifespan. She holds the Susan and Richard Fade Endowed Chair, is a Research Associate Professor in the Department of Speech and Hearing Sciences, and Adjunct Research Associate Professor in the Department of Psychology at the University of Washington. She is also a licensed psychologist in the state of Washington. Her research is carried out at the UW Autism Center and Center on Human Development and Disability. She is the principal investigator on two intervention studies for very young children with early signs of autism; these are collaborative studies between the UW Autism Center, UC Davis, and Vanderbilt University using the Early Start Denver Model and A Work in Progress. Dr. Estes is also the co-principal investigator of the Infant Brain Imaging Study Network (IBIS) with Dr. Stephen Dager of the University of Washington site. Dr. Estes is especially interested in the role of the family in supporting positive outcomes for children with disabilities and improving the lives of people with ASD. Ashley Penney, M.Ed., BCBA, is a behavior and education consultant at the UW Autism Center and a certified special education teacher. She received her M.Ed. in Special Education with an emphasis in Applied Behavior Analysis at the University of Washington in 2009. Upon completion of her degree, Ashley coordinated an intensive instruction program for preschool students with autism in the Lake Washington School District. Ashley has experience in early intervention, applied behavior analysis, challenging behaviors, supporting children with autism in a variety of educational settings and providing workshops and trainings. Ashley became a board certified behavior analyst in 2009. She is also certified in Reciprocal Imitation Training (RIT), a naturalistic behavioral intervention for young children with autism. She is currently a doctoral student in special education at the University of Washington and is interested in early intervention for young children with autism, social communication, and strategies that promote adult learning and professional development.